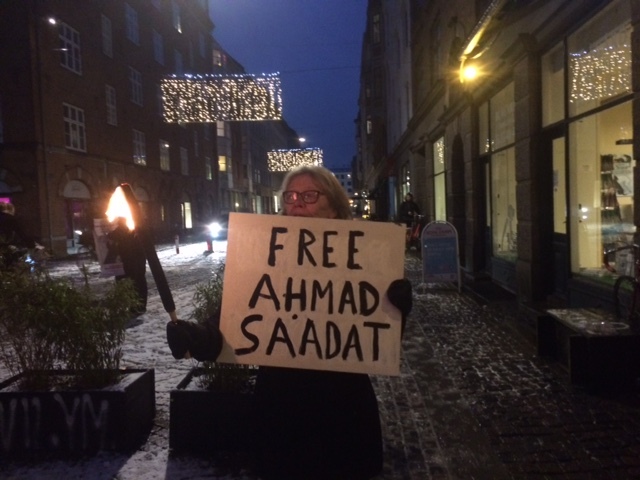 The Internationalt Forum Middle East Group organized an information sharing action in Copenhagen on Monday, 21 January as part of the International Week of Action to Free Ahmad Sa’adat. 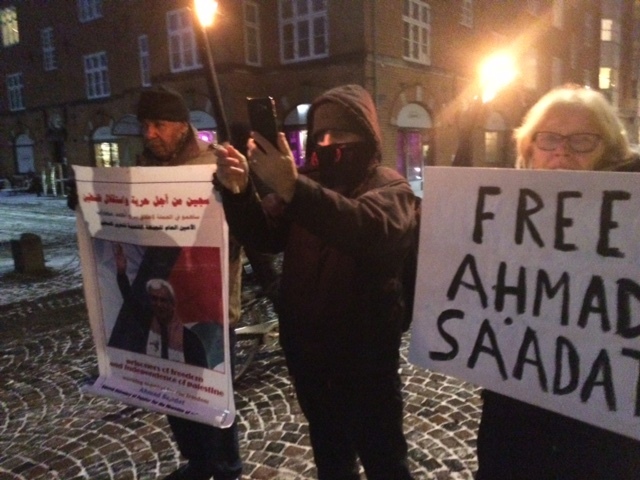 Following on an earlier event raising funds to support Palestinian prisoners’ advocacy, the event included the distribution of flyers and literature about the case of Ahmad Sa’adat, the imprisoned General Secretary of the Popular Front for the Liberation of Palestine, and his fellow nearly-6,000 Palestinian political prisoners in Israeli jails. The participants distributed hundreds of flyers to passers-by amid a rainy, snowy evening. Despite the winter weather, activists reported that the information was very well-received by people on the streets, especially on Blågårdsgade, where the participants gathered. They also distributed information about the boycott, divestment and sanctions (BDS) campaign and the boycott of Israel. One campaign involving many activists in Denmark and across Europe is the campaign to boycott the Eurovision Song Contest so long as its finals continue to be scheduled in apartheid Israel. Organizers across the continent are participating in creative actions, petition campaigns and protests, urging that the final series be moved. The protest came as part of the international events marking the 17th anniversary of the political leader’s arrest by deception by the Palestinian Authority on 15 January 2002. He was imprisoned by the PA for four years under U.S. and British guard, part of its security coordination with the Israeli occupation. In March 2006, shortly before newly elected PA officials were to be sworn in, Israeli occupation forces violently attacked the PA’s Jericho prison where Sa’adat and his comrades were held; the U.S. and British guards moved aside in advance to support the attack, in which two Palestinians were killed by the Israeli forces. Today, Sa’adat is serving a 30-year sentence in Israeli occupation prisons. As Israeli elections approach, politicians have competed with one another to urge harsher repression and violations against the prisoners. Gilad Erdan, the Israeli minister over the Israel Prison Service – who also is responsible for the apartheid colonial state’s global anti-BDS campaign – has launched a string of attacks on the prisoners, cutting their water supply and confiscating thousands of books. 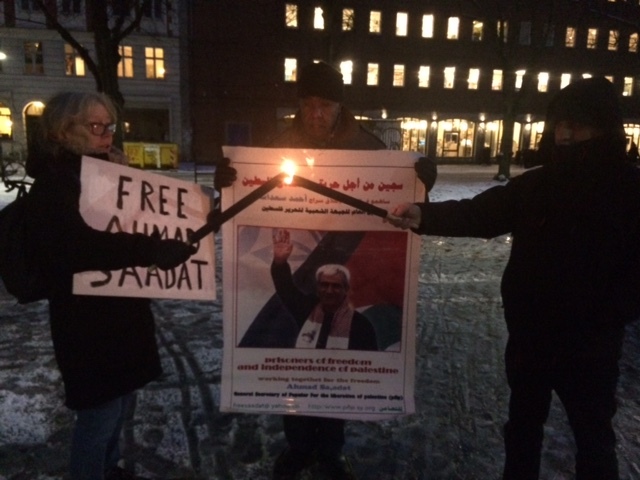 The Week of Action is continuing with upcoming events in Sao Paulo, Athens, Alicante, Toulouse, New York, Paris and Milan, highlighting the struggle of Palestinian prisoners and Sa’adat’s case in particular.